I was showing someone how to model a talent yesterday and as an example we picked the talent of being able to tune a guitar. I'm not going to go through the whole process here, but I wanted to share some important points which really exemplify what talent modelling is all about. When you get into the fine detail of how an expert does what they do, you'll often find that they don't just make it look easy, they really do make it easy. They stack the odds in their favour. The musician that we modelled didn't tune his guitar to concert pitch unless he was playing in a band. In general, he tuned his guitar to itself. If he needed to play with other musicians, he simply tuned the first string to a known note from an electronic tuner, and then used his method to tune the remaining strings. He described his method as "the most effective" way to tune a guitar. It's not the way that a learner would be taught, but it was the quickest and most accurate way for his purpose: to play it. Therefore, he doesn't tune the guitar to 'open strings' as a learner would be taught to do, because that's not how you play a guitar. He tunes the guitar to a particular chord that is near the middle of the range he would use to play the guitar. This automatically makes an acoustic guitar more resistant to dropping out of tune as the strings naturally loosen while being played. With an electric guitar, he would adapt his approach, using a slightly different method that again was suited to how he would play the guitar. The model has become so refined in the mind of an expert that they can't easily explain how they do it. When they do explain, it, they use such generalised terms as to be useless to someone wanting to reproduce the talent. What started as a conscious process has collapsed down through the layers of the expert's brain until the majority of the decision making takes place outside of conscious awareness. In the book, you'll see a cross sectional functional diagram of the brain, adapted from the illustrations in Steve Grand's excellent book, 'Growing Up With Lucy', where higher cortical functions are initially required to complete the task, but as the brain 'learns' the task, the connections collapse back towards the brain stem, like streams of water finding a quicker path across sand. Watching the musician tune his guitar, it seemed obvious to assume that he would compare the note produced by the string with an internal point of reference, a 1:1 comparison. But this wasn't what he did at all. He tuned pairs of strings together and made a 2:1 comparison. This actually has some advantages over 1:1 tuning. It has built in error checking, and it's quicker. And since our sensory organs are signal discriminators, built to detect differences, the best way to use them is to intentionally create difference. Here's a picture of a guitar string. The lowest frequency that the string can resonate at is called the 'fundamental'. If you blow air across a long length of tube, or blow across the top of an empty bottle, you're making the air inside the bottle resonate at its fundamental frequency. The same thing happens when you pluck a guitar string or 'excite' a violin string with a bow. 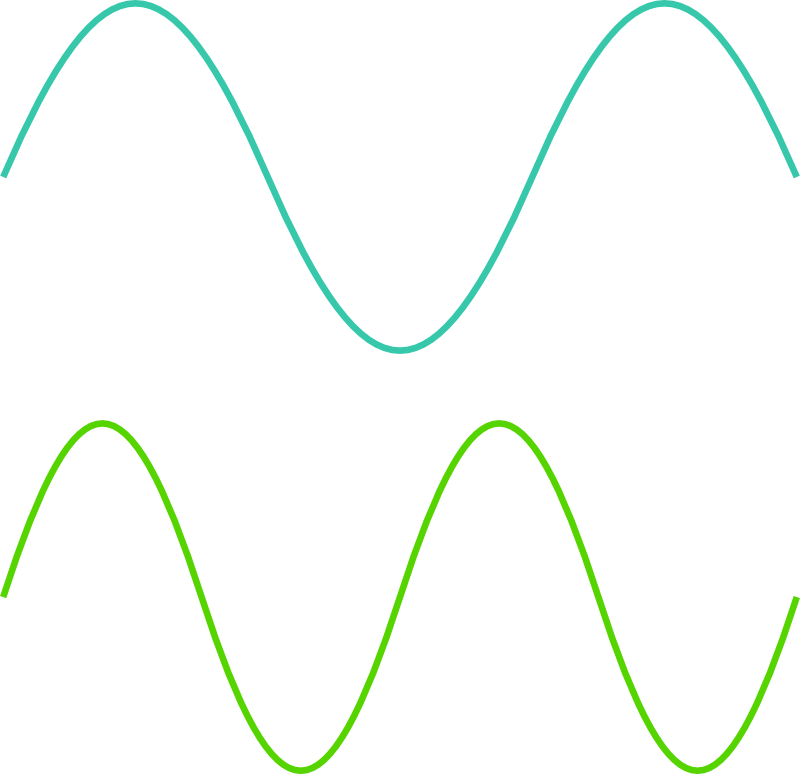 The colours in this picture show the 2nd, 4th and 8th harmonics of the fundamental frequency; the frequencies at which a 'wavelength' exactly fits the length of the string. At the 3rd harmonic, 3 waves would fit perfectly into the length of the string, and so on. What happens when you shorten the string by placing your finger on a 'fret'? The note changes because the string is now a different length. The shorter the string, the higher the 'pitch' of the note. When you play two notes together on different strings, the instrument doesn't produce two notes, it produces one complex note. Here, the blue and green lines illustrate two different frequencies. The waves collide with each other in the body of the guitar and in the air, sometimes reinforcing each other and sometimes cancelling each other out. The result isn't a smooth wave, called a sine wave, as in the top diagram, but a complex vibration which is made up of the sum of the component frequencies. But your sense of hearing works by separating out frequencies, so we think that we hear two notes. When those notes are 'in key' the harmonic sounds 'right', simply because of the way that our auditory cortex works. When one note is out of key, even by the smallest amount, we hear the difference as a strange 'beat' in the note. That's what the musician was listening for. By working through the six strings as pairs, he is able to cross reference the tuning process so that it doesn't matter which string is out of tune, the overall process will eliminate those errors. The whole process starts and ends with a very elegant check; a G chord. G uses all six strings, and allows the musician to check, in a single stroke, the tuning of the guitar. He starts and ends the tuning process with a G chord, replicating the Test stages in the TOTE process (Test Operate Test Exit). Someone who can tune a guitar string to a reference note can make a 1:1 comparison, but they don't have the memorised 'template' for what the 2:1 comparisons should sound like. So to teach the talent, we need to create a three stage process; first teaching a 1:1 method, then teaching the sound of the 2:1 comparisons, then teaching the 2:1 tuning method. That process will take a few hours, whereas the musician originally took years to work it out for himself. The entire model took maybe 30 minutes to elicit. It was efficient, quick, counter-intuitive and flexible. And this is the final hallmark of a talent; when you figure it out, it's almost awe inspiring in its elegance.